The number of UK homes with at least one of Netflix, Amazon Prime Video or Now TV rose 22% year-on-year in Q3 2018 to reach 11.6 million, according to BARB. The UK’s TV-audience measurement company estimated that some 40.9% of UK households used a subscription video-on-demand service in the third quarter of last year, with Netflix the most popular choice among viewers. According to BARB’s Establishment Survey, which is a continuous interview-based study of 53,000 households, Netflix was used in 9.7 million homes in Q3 2018, an increase of 2.2 million compared to the same period a year earlier. Amazon’s SVOD offering was second most-popular service and was used in 4.9 million homes, up by 1.1 million homes in a year. Now TV came third, adding just under 200,000 users to give it a reach of 1.6 million homes in Q3 2018. Based on these stats, which were published today in a BARB paper titled ‘The SVOD Report: Charting the growth in SVOD services across the UK’, the household penetration for SVOD services stood at 40.9% in Q3 2018, compared to 33.7% a year earlier. Netflix was used in 34.1%, Amazon Prime Video in 17.2% and Now TV in 5.7% of UK households in Q3, up from 26.5%, 13.6% and 5.1% respectively in Q3 2017. 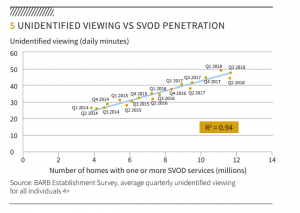 In the same SVOD report, BARB noted an increase in ‘unidentified viewing’ among its viewing panel of 5,300 households for the year to September 2018. This is viewing, done on a TV, that can’t be measured using BARB’s existing measuring technology, and could include watching SVOD services like Netflix, Amazon or Now TV, viewing other online services like YouTube, playing games on games consoles or watching DVDs. In the 12 months to September 2018, time spent on unidentified viewing increased to 19% of all TV set activity, up from 16% in the preceding 12 months. In minute terms, this marked a rise from 40 to 46 minutes a day on average. 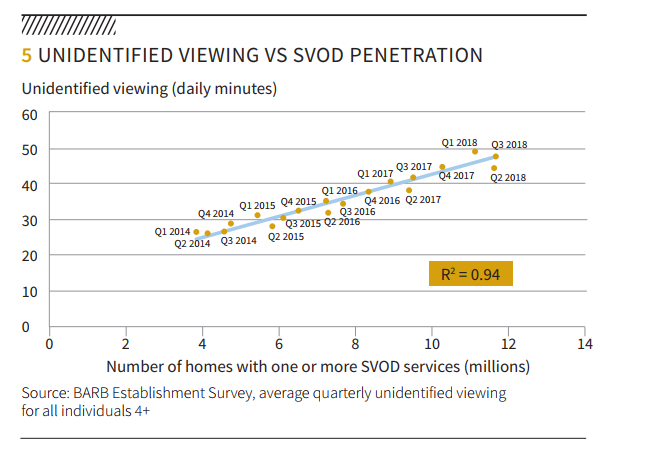 By cross-comparing unidentified viewing with SVOD penetration figures from its Establishment Survey, BARB saw an increase in unidentified viewing as a strong predictor of increased SVOD penetration. “What is driving the growth in unidentified viewing? As the name suggests, we can’t be certain, but we do have a growing body of evidence that points to SVOD services being a primary catalyst,” according to the BARB report. BARB is currently testing router meter technologies from Nielsen and Kantar Media in a bid to get a more accurate picture of SVOD consumption. These meters can be attached to broadband routers to get a read on aggregate viewing of SVOD services. However, there is no word yet on if or when this is likely to be incorporated into BARB’s panel of homes.